Earlier this month, ShikShin Choi Sooyoung guested on the popular karaoke-themed show 1000 Song Challenge alongside her Midnight Entertainment co-host Yoon Dohyun. 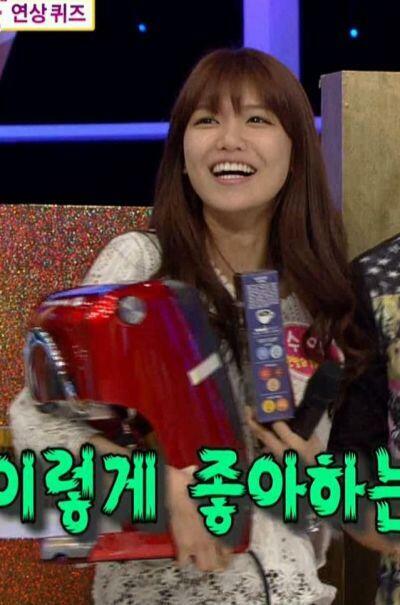 Sooyoung won big on the show, taking home a sparkly new espresso machine, in hot-rod red no less! Look at that happy little winner! Check below for the cuts (edited to avoid being taken down). At the end, they said that Sooyoung and Yoon Do Hyun were the winner so they didn’t only win the expresso machine but the whole episode too, right ? Lol! She is so used to being the tall one, when she hug the guy, her arms are on top of the guy’s shoulder unstead of under.